The most common yet very famous among Nepalese because of its traditional values. A must for a Nepali. This is the most common yet very famous among Nepalese because of its traditional value. It is believed that every Nepali family should own a Bhojpure Kukri for good fortune and prosperity. Some also keep for religious ceremonies. 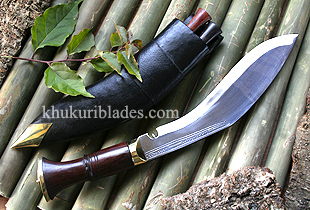 Bhojpure village in the eastern Nepal is renowned for its production and top quality of this kukri. Since ancient time, Nepalese villagers have been using this kukri for everyday domestic work.